At TruckingTruth, we've done a ton of research for you! We've contacted the company recruiters at USA Truck and put together a fantastic review of the USA Truck paid CDL training program. USA Truck went from 10 trucks in 1983 to over 1,600 trucks today. That's some serious growth! After speaking with recruiters and performing several hours of research, my overall impression of USA Truck is very positive. One thing that sets USA Truck apart from many other training companies is they are considered a "medium haul" carrier. Basically, that means most of their drivers by default run mostly regional. You will still be expected to run anywhere in the country as USA Truck does operate in all 48 states and Canada, but the majority of the time you'll remain east of the Mississippi River. Most of their drivers remain within 500 miles of their home and within 6 to 12 months, the majority of drivers are placed on some sort of dedicated or regional account. This has the advantage of drivers going by the house more often and running in more familiar areas. The disadvantage is drivers will not life the full "OTR lifestyle" of traveling and seeing large portions of the country. It also means you must live within their main operating areas to become eligible for hire (generally the eastern half of the country). The CDL schooling appears to be well run with a decent tuition structure. However, the penalty for leaving within the first 12 months is much higher than many other company sponsored options. We always stress the importance of staying with your first company for a minimum of one year, but that's especially important in this case. Of course you should always do your own research and weigh as many possibilities as you can, but in general if I was personally looking to begin my truck driving career, I would make USA Truck a serious consideration. Today, with more than 1,600 driving team members, USA Truck is one of the nation’s largest over-the-road Truckload carriers. Their distinctive white tractors and trailers bearing the bar and star logo is an ode to our nation’s military from one of their founders, a former military aviator. Under that banner, they provide capacity solutions to a wide customer base throughout North America. Subject to background investigation, including but not limited to: criminal history, FMCSA Pre-Employment screening report, driving record and previous employment inquiries. Where do you hire from and what are your no-hire zones? While USA Truck operates in all of the lower 48 states, the majority of their freight is in the Midwest and east coast. Therefore, they generally only hire from those areas. USA Truck does not hire from the state of Illinois due to licensing issues. Even though a passport is not required, we highly recommend obtaining one. The ability to haul freight into Canada will give you more options to make more money and run more miles. Crossing into Canada has become very streamlined and is not a complicated process like it used to be. It's also important to obtain as many CDL endorsements as possible, especially a HazMat endorsement. You should always keep yourself as marketable as possible for future opportunities and having endorsements will only help you with those opportunities. As always, bring as much paperwork with you as possible including any medical records or forms which could prove past employment and help with the background investigations. Finally, be certain that your birth certificate and social security card are originals (no copy's) and are not laminated. USA Truck works with several truck driving schools across the country and will help locate a school for you based upon where you live. What is the cost structure of the schooling? After attending school, you will be required to remain with the company for one year. During that year you will pay $45 per week through payroll deduction to help pay for the schooling which equates to $2,340. However, at the end of one year you will be reimbursed $1,245, so the total cost for your schooling will be $1,095. You will not begin paying the $45 per week until your time with your trainer is complete and you are in your own truck running solo. If you quit working for the company before your 12 month obligation is complete, you will be required to pay for the portion of the schooling that remains. The total cost of the schooling is $6000, so whatever is left after deducting the amount you've paid in at that point is yours to pay. What are all of the up-front costs? The only basic up-front expenses are a $50-$100 fee for getting your CDL permit - sometimes less - depending on which state you attend school in. The cost of transportation to the school and lodging are covered. Will my meals be paid for? No, students will need enough money for basic living expenses including meals while at school. Will my room be paid for? Yes, lodging is paid for, but you may share a room with 1 or more students. Can I pay for my CDL training up front and have no further obligation? Yes, there are options to pay up front with no contractual obligations and a higher starting mileage pay. The up front cost of training varies based upon your location and the specific CDL school you will be attending, so you will need to speak with a recruiter to obtain these details. What are the obligations for paying back the schooling after graduation? With no down payment, drivers will pay$45 per week for 1 year (beginning once you go solo). At the end of your 1-year commitment, you will be reimbursed$1,245 for a total cost of $1,095. If you leave before the contract period is over, you will owe the remaining balance of $6,000. So after 6 months, you'd have a remaining balance due of $4,920. There are other options if you choose to provide a down payment, but no down payment is necessary for enrollment. If you would like to inquire on options for a down payment, contact a recruiter because the plans change on a constant basis. The cost structure of the schooling is right on par with the industry average, including the financing, but if you leave before the 12 month contractual obligation there is a very hefty penalty. If you'd like to shorten the term of the contract period or eliminate the contract period all together, there are several different voluntary deposits you can make. CDL, original Social Security card, birth certificate, and if applicable, Resident Alien card, Permanent Resident card, or I-94 with a VALID foreign passport. if you are regularly taking medication, you will need 2 months worth to ensure that you have enough for the time that you are out with your trainer. At least 7 day's worth of clothes, a pair of hard-sole shoes, work gloves, jacket. Loan agreement, contract, or your receipt if you paid for your tuition in full. List of names, Social Security numbers, and birth dates of dependants for enrollment of insurance benefits. List of names, phone numbers and addresses of 3 personal references (family/friends acceptable). Clipboard, pens, calculator, trucker's atlas, battery operated alarm clock. Towels, washcloths, all other necessary grooming items you may need. A laundry bag is recommended, to store soiled items. Bring your personal belongings in a soft sided duffel bag, rather than a suitcase if possible. When packing your clothing, please remember to plan for all types of weather conditions, for you never know what the weather will be like in any given area of the country. A voided check or deposit slip which includes the bank routing number and your account number on it. A TYPED document from your bank with this information on it is also acceptable. Do I need to get my CDL permit before attending school? No, you will study for and obtain your CDL permit once you arrive at the school. While a Passport is not required for employment, USA Truck does haul freight into Canada and a valid passport will help ensure more miles with the availability to cross the border. Which CDL endorsements are required or encouraged? A HazMat endorsement, while not required, is highly recommended to maximize the freight available to you, thereby increasing pay. The first week is mostly spent in the classroom, and the next two weeks will divide your time between classroom, maneuvering the truck in the yard, and on the road training. Classroom training will cover systems and components of a truck, rules, regulations, trip planning, and other important details that all truck drivers must know to be a safe driver. maneuvers such as turning, backing, and gear shifting while on the road training will prepare you for rural roads, highways, expressways, and city streets in both congested and non-congested areas. How long is the training overall? Classes are generally 3 to 4 weeks long, but may last up to 6 weeks depending on the school you are sent to. How much time on the range backing up? Behind the wheel time is divided between both the range as well as driving on public roadways. All state minimum requirements are exceeded. During the practice range phase, how many students share one truck? Usually the maximum number of students per truck is 4. How much time in classroom? All state minimum requirements are generally exceeded, but typically classroom time is at least 40hrs long. Is the training period based on number of days, number of driving hours, number of miles, or some combination? Training is a minimum of 4 weeks long and may take up to 6 weeks to complete. How much will I be making when I'm on the road with a trainer? You will make a flat salary of $350 per week while training. Do they run your trainer and you as a "team" operation or like a solo truck? Initially, all training trucks are dispatched as solo operations. Once the trainer feels the student is safe enough to drive alone it will become a team operated truck. Do you have a "No sleeping in the top bunk while the truck is rolling" policy? Yes, nobody is allowed to sleep in the top bunk if the truck is in motion. What is your policy for handling disputes between trainer and student? Trainees are assigned a driver manager as their point of contact in case any issues arise. Disputes are handled on a case-by-case basis but if necessary, a new trainer will be provided. Can you get a non-smoking trainer? Yes, a non-smoking trainer may be requested. What are the company's minimum qualifications to be a trainer? Minimum of 6 months experience but most trainers have several years of driving experience. Is there more than one student per trainer and truck? No, there is only one student per training truck. While the initial training pay is slightly lower than the industry average for training pay, this should not be a deciding factor. The difference in pay over the entire duration of your training is insignificant when you consider you'll be averaging a minimum of $30k to $40k within your first 1 to 2 years as a truck driver. Think of this portion of your your career as "Truck Driving University" and don't worry about the initial salary. What's important now is getting you trained and employed so you can make the real money as a solo driver. 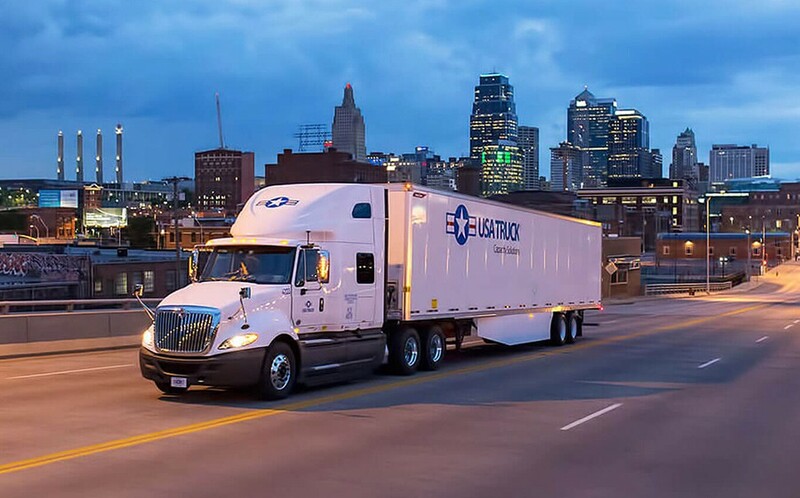 The hiring requirements at USA truck are on par with most other major trucking companies, but note they mainly hire from the Midwest and east cost. While USA Truck does haul freight to all of the lower 48 states and Canada, the majority of their freight will be limited to the eastern portion of Texas and east of the Mississippi river. Unlike most training companies, this is a "medium-haul" carrier and is largely regionalized. How much will I be making once I'm running solo in my own truck? Starting pay is .26 / mile with an increase every three months during your first year. If you chose to put down a deposit for your CDL schooling, the starting pay can be as high as .28 per mile with your first raise after 6 months. When will I receive pay increases? What health insurance and benefits do you have? What is the average cost of medical benefits? How long until you qualify for benefits? Initially, the starting pay is a bit low. But USA Truck offers bonuses every 3 months during the first year. By the time your first year is complete, the pay is actually above average for the dry van industry. We always stress that you should under no circumstances leave your first company before at least 1 year and especially not before your contractual tuition payment obligations are completed. No, pets are not allowed on company equipment. What is the company's rider policy? Drivers are allowed to have 1 rider over the age of 12 years old by paying a $7.50 / month insurance fee. Can a new driver run regional or dedicated right after school? While most drivers begin their career in the OTR division, there are quite a few regional and dedicated positions available after 6 to 12 months, with many more regional opportunities than dedicated. USA Truck is a fairly regional operation as it is, mostly running the midwest and east coast. Drivers can typically go home after 14 days and take 2 days off, but drivers who choose to stay out for 4 weeks may take 4 consecutive days off. Will there be any NYC? How soon would a new solo driver be expected to go there? While USA Truck dispatches drivers to the NYC metro area, drivers will not be expected to go into downtown areas of the city. Are you forced dispatch? Is the driver given any options for different loads? Drivers are forced dispatched based on available hours and freight. This helps to maximize profitability for both the driver and the company. At times, a driver will be given options of two or more loads. How often can I expect to be home? For how long at a time? Drivers can expect to go home every 2 to 4 weeks earning 1 day off for each week out. What percentage of freight is drop and hook? Typically more than 80% of USA Truck freight is drop and hook. Do you have a leasing program, and will I be persuaded or incentivized to lease? While USA Truck has dismantled the company leasing program, independent contractors may lease or purchase a truck from a third party and drive under an independent contractor pay scale. USA Truck has 100% dry-van freight with OTR, regional, and dedicated positions available. USA Truck is considered "medium-haul", meaning they naturally stay regional most of the time. USA Truck in particular doesn't leave the Midwest or eastern half of the US very often and drivers often remain within 500 miles of their home location. This allows many of their drivers the option to go home every 2 weeks instead of every 3 to 4 weeks without being on a dedicated or regional account. After 6 months to 1 year, many drivers are placed within specific regions or dedicated accounts which only solidifies their home time. So if you're looking for a carrier that will get you home a bit more often, this may be a good choice for you. The fleet mostly consists of late model Kenworth, Freightliner, and International conventional tractors. Do you run electronic logs? Yes, the company is currently switching over to electronic logs with all new incoming drivers starting on electronic logs. What are your trucks governed at? Trucks are restricted from 60 to 65mph. Do you have APU units? All new trucks entering the USA Truck fleet are being equipped with APU's. As with most larger companies, their trucks are generally newer and well maintained. USA Truck has more repair facilities than most companies of its size, so maintenance shouldn't be much of an issue.